In 2013, Audi debuted technology at the Consumer Electronics Show that allowed an A7 to navigate a parking garage and then back into a spot seamlessly. This year’s iteration of the conference showed the industry’s still trying to pursue more auto-parking aids. Numerous automakers from Ford to Tesla have adopted some form of automated parking into their cars in recent years, which makes sense: it’s arguably one of the smartest applications of self-driving technology. There’s plenty of drivers that do a terrible job at maneuvering their car into a parking garage spot, and it could free up additional space in parking garages. But what’s strange is how, despite being equipped on numerous luxury vehicles, it doesn’t seem to be widely used. That’s one thing automotive supplier Hitachi Automotive Systems tried addressing this week. The Michigan-based company has been showing off new autonomous technologies it developed with its subsidiary Clarion. Using an Infiniti Q70 sedan outfitted with autonomous tech, Hitachi demonstrated how it’s valet parking system would let a vehicle drop off a driver, who would then identify an available space on a smartphone app. From there, the car sets off and situated itself seamlessly into the spot. Of course, it’s not as easy as it sounds. The tech requires access to mapping data for an entire parking garage or lot, but officials with the company said that’s not as big of a hurdle as it seems. “As long as we have the map, it should be able to work anywhere,” said Andrew Lakin, an OEM Product Specialist with Clarion. With just maps alone, cars equipped with a basic set of cameras could be able to locate spots. In a demo ride, a Clarion exec explained the tech’s designed to recognize when a driver has entered his or her neighborhood. When that happens, the car—programmed in advance—knows where to park itself. Moments later, the Infiniti we were in took over and parked with ease into a spot. Again, it seemed like a simple application that drivers could easily get behind when they’re trying to find spots at a shopping mall or the like. 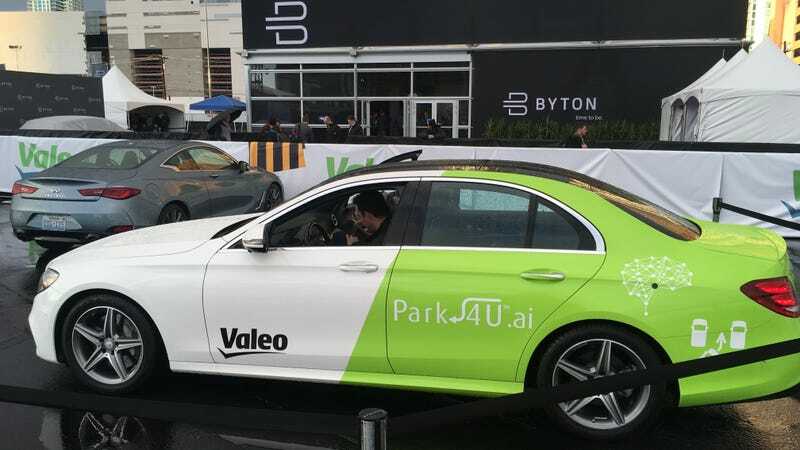 Auto parts supplier Valeo also developed new autonomous parking technology that it showed off at CES. The company developed a technology with Cisco called Cyber Valet Services, which allows for a similar service: the driver gets out of the vehicle at the entrance to, say, a parking garage, and drives off to find a spot. The hurdles here are obvious. Valet services of the future need buy-in from a wide swath of stakeholders to outfit parking areas with the sort of technology that can coordinate autonomous cars. That’s a big lift, and an even bigger cost. But the Hitachi and Clarion valet service showed it seems easier to tackle than some may realize. Maybe people just don’t mind parking, but I certainly think it’d be nice one day to end the dreadful practice of circling an endless parking garage for an elusive spot.